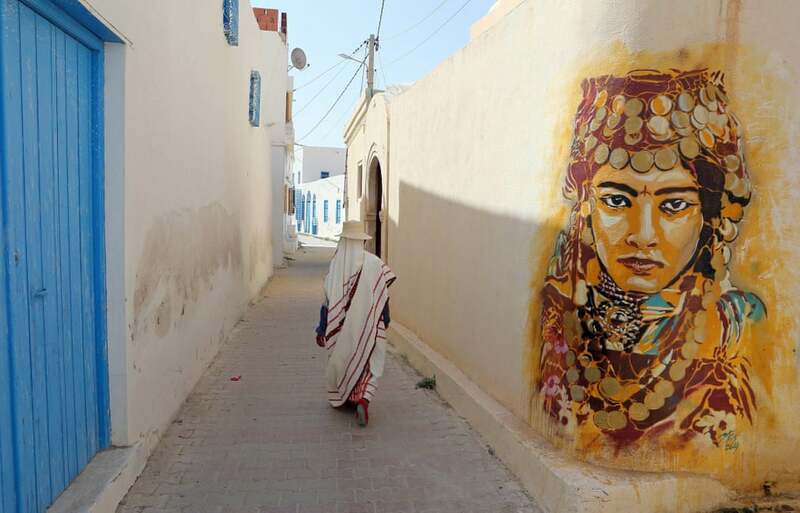 Mural art was not a common phenomenon on the walls of Tunisia’s picturesque village Erriadh, it was not even welcome there. But it was time for a change and Erriadh did it! 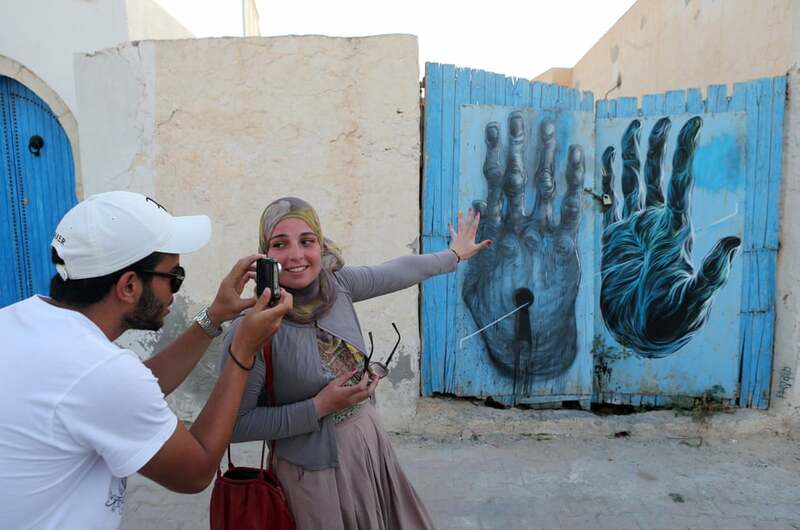 The island of Djerba – known as the „Island of Dreams“ – invited 150 international artists to take part in the street art project „Djerbahood“, curated by the Tunisian-French galerist Mehdi Ben Cheikh. 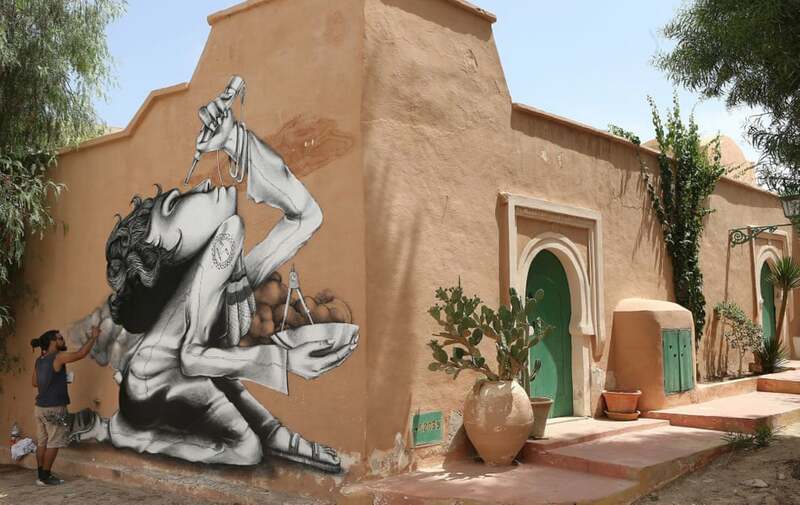 One of the oldest villages in Tunisia has a new breath, through artists‘ work, which gives it a new dimension and has become one of the venues for street artists. 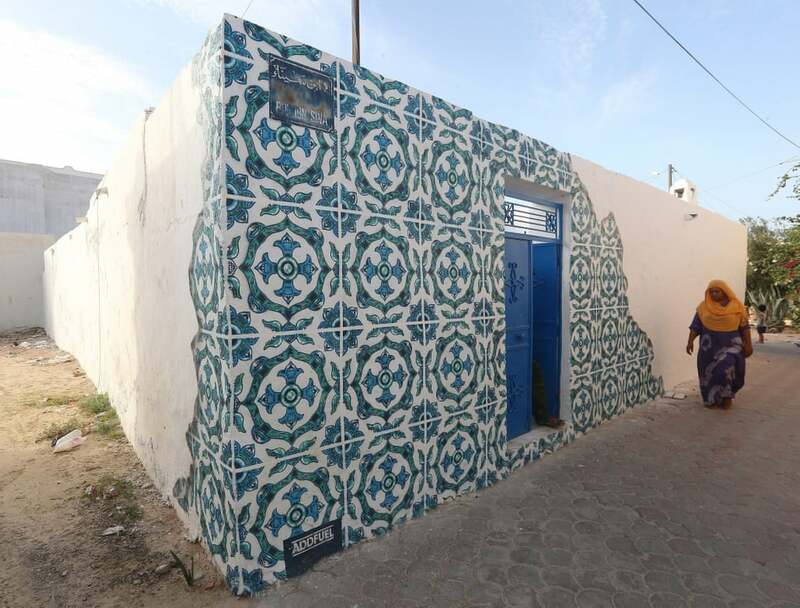 The village of Erriadh is one of the oldest in Tunisia, where Jews, Muslims, and Christians have lived together for centuries. 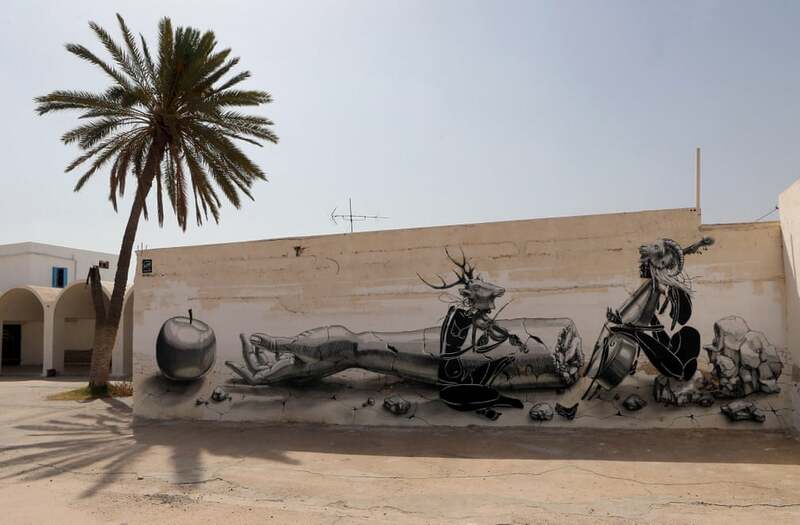 A mural by German artist Dome. A mural by Belgian artist ROA. Brazilian artist Claudio Ethos works on his mural. Claudio Ethos is a Brazilian urban artist. His work is often twisted manipulation of images and landscapes with abstract and surreal tendencies that explore the more spiritual side of the artistic process. Ethos has been interested in graffiti since the 90’s. He was surrounded by Pichacao (the Sao Paolo tag hand style) and began spray painting around the age of 15. His style is so unique that one can easily distinguish it at a glance. His murals were the reason why many of the traditional contemporary artists took a second look at street art. 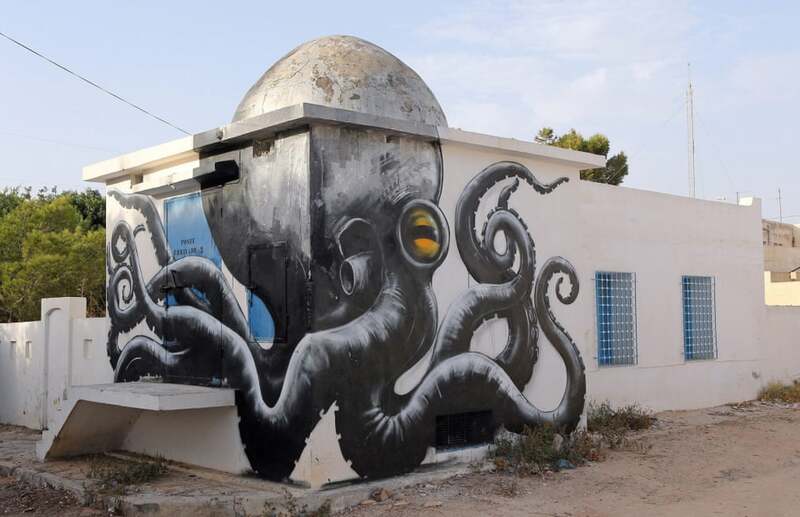 By using a minimal color palette – he creates these large scale surreal murals that have not only conquered his country, which is filled with many known street artistic figures, but Claudio has also captured the eyes of many around the world. Mural by Portuguese artist Diogo Machado, better known as Add Fuel. Mural by Spanish artist Btoy. 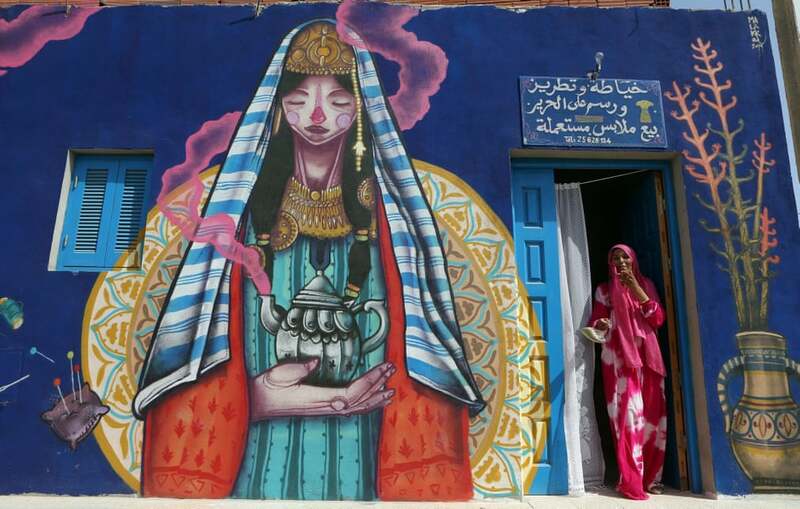 A seamstress stands at the entrance of her workshop decorated by Spanish artist Malakkai. Mural by French artist Bom.K. Veröffentlicht in contemporary art, Drawings, Graffiti, Murals, Paintings, Projects, street art, urban artBookmark the permalink.